I’ve seen Harry Connick, Jr. live something like four times now and he never disappoints. 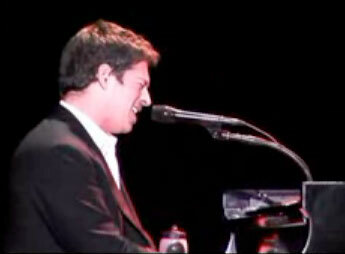 Harry Connick, Jr., born in New Orleans, USA, 1967, is a singer, pianist, composer and arranger. The style and repertoire of this student of Ellis Marsalis is closest to Jazz, through Swing and popular North American songs. He’s a modern-day crooner with a baritone register that some, because of his artistic leanings, associate with Frank Sinatra, but which in terms of style and timbre is actually more similar to Tony Bennett or Mel Torme. Connick’s career began with two albums which were heavily influenced by jazz and later tended towards a more “popular” style. . . After Chanson du vieux carre (06), with his Big Band, an album of songs associated with Crescent City and a new take on the great hits that evoke New Orleans, he’s released Oh! My Nola (07), which fuses rock&roll, country, blues and ragtime melodies.